Pedernales Falls State Park has arguably some of the most beautiful and unique scenery in the Texas Hill Country. While the river itself is reason enough to visit the park, scenic trails wind through forests, atop ridges, and along the riverside. 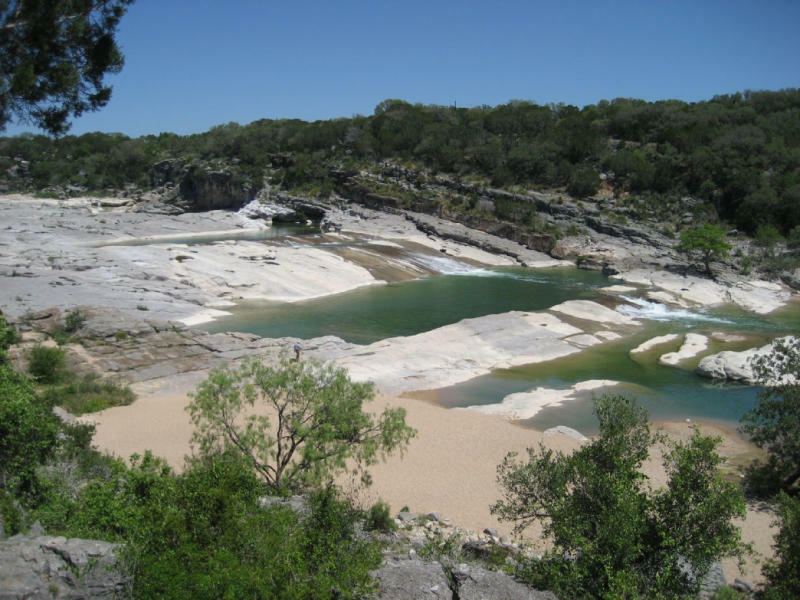 Walk the sandy shores of the Pedernales River and climb on the river’s rock formations. You can cross its waterfalls (water levels permitting), and delve into the nooks and crannies formed by the boulders in the riverbeds and along the shoreline. The scenery at the state park is beautiful, and with several miles of trails visitors have countless ways to explore the terrain. Pedernales Falls. Courtesy of RootsRated, credit Jenn Derring Davis. Pedernales Falls State Park is beautiful to visit throughout the year, both for day trips and overnight camping excursions. With a range of trail distances and varying degrees of difficulty, visitors can easily make a day trip to the park or set up camp for a weekend, exploring multiple trails that crisscross the land. The scenery is wild and unusual, with rock formations and waterfalls that are unique to this section of river. If you’re up for a long hike, the Juniper Ridge Trail (just shy of 9 miles) is a challenging but beautiful way to explore the terrain. Otherwise, you can choose a shorter trail, or even an equestrian trail, which happens to be the park’s longest at just more than 11 miles. One thing is mandatory for everyone, though, and that’s a short trek to the park’s namesake waterfall. It’s an easy walk down to the sandy beaches and a rocky riverbed lined with white cliffs. For stunning sunset views, hike one of the park’s overlook trails, which give expansive views of the curvature of the Pedernales River and wild displays of color. Because of the range of activities and trails at Pedernales Falls State Park, it’s safe to say that most everyone loves the park. The drive itself is scenic, with access to overlook points that require little effort along the way, and longer, technical trail routes that require a good level of fitness to complete. With every range of trail difficulty represented within the park, both seasoned hikers and casual explorers will enjoy trail options. Photographers also love the park, with its unique landscape and darkness at night, making for incredible night photography opportunities. Stargazing, geocaching, and camping are all favorite pastimes of visitors, too. Check out this interactive trail map, showing the distance of trails throughout the park. Follow any posted “no swimming” signs and observe swimming only in areas of the park where it’s permitted. Pack in enough water in the summertime, particularly for the longer trails. Sections of trail are not shaded and the Texas sun can be intense. Be mindful of wildlife and cautious of rattlesnakes, which can be active, especially in the summertime.